The next morning, I woke to find nothing too sore nor broken, apart from my pride, so I called a cab for 9am and got straight back into it. I was entering Harriman State Park and I found it to be absolutely beautiful, so much so that I posted a few pictures on the My Appalachian Trial Facebook page to prove the point, along with this short video. Everything was going well and the hiking was fairly easy thus far, when I came to the Lemon Squeezer. This is so-called because of the excruciatingly narrow gap that hikers have to squeeze through. I took my pack off and shoved it onto a rock, then climbed out, only to see J-Rex and her boyfriend, Max, coming along behind. I took their packs as they climbed up. Thinking that it hadn’t been too bad, we saw the next part, which was a very, very sheer wall of about seven feet. Max climbed up, discovering several tiny hand and footholds, then we pushed J-Rex’s pack and mine up to Max and managed to pull ourselves up. I couldn’t help thinking at the time that I would have been unable to do this had I been alone, though I tend to prefer to hike by myself, at my pace. With the tougher New England states coming up, I wondered whether or not a hiking partner might be sensible. I was looking for water at this stage and ran into the Maine Sisters coming out of a shelter with no water. I told them that their old partner J-Rex was just behind, then I moved on. I eventually found some water at Beechy Bottom Brook and decided that I’d had enough for the day a few miles later, at Seven Lakes Drive. By this time, I only had about ¾ of a liter left, so I set up my tent just off the road and out of sight, as I wasn’t really supposed to camp there. Diane has never been crazy about me camping alone, but I really enjoy the occasional night like this, as the solitude allows me to think completely uninterrupted. Given the limited water that remained, I had a wrap for dinner to preserve some for the following morning. That night, at around 1.30am (why do these things always happen in the dead of night? ), I was woken by the sound of coyotes baying, presumably, at the moon. While I always feel irrationally safe in my tent, noises like this, with nobody around, tend to make the next thirty or so minutes a touch uncomfortable. After a few “ow, ow, owwwwws” the little blighter decided to give it a rest and I drifted off. For breakfast the next day, I limited myself to coffee and a Snickers, as I had about 4 miles to go, up and over Bear Mountain, before getting a chance to refill my water bottle once more. The hike was much easier than I had thought and very much resembled, in my imagination, a walk along the ramparts of Sauron’s castle in Mordor from Tolkien’s Lord of the Rings. This video shows some of the steps up and you’ll notice that I was talking more Indiana Jones than Lord of the Rings, though I think you’ll get the drift. Further up, the path ran alongside a lovely view to the left. I met a Chinese couple near the top, having breakfast on a neatly laid out mat. When they found I was a thru-hiker, the guy very sweetly, and with much solemnity, presented me with a pack of blueberries, which I gratefully accepted and wolfed down when I was out of their sight. I had assumed I was at the top but, in fact, there was still further, though pleasant, climbing to get to the top. At the very top were restrooms and soda machines (not at all like Mordor) so I gulped down a Powerade and bought some water to top up my bottle. Everything at the top of the mountain is done with the day hiker in mind, as it is the busiest mountain on the entire trail and the path is brilliantly managed and maintained. The stairs down, over 700 of them, were strenuous, but magnificent and the trail took me down to a park, with families preparing food for a big day out. I refilled with water once more and strolled through the park, trying my hardest to look as pathetic and hungry as possible in the hope they’d throw me a hot dog. Didn’t happen! I’m clearly not as pathetic and hungry as I think I am. Through the park, I was led to the zoo, and arrived just before opening at 10am. I hurried through the zoo, though the lady who let me in found me some peanut butter crackers, so the pathetic hungry look worked out a little after all. Crossing the Hudson via a bridge was the lowest point on the entire trail, about 124 ft, and the 1400 Mark was passed without any discernible marker. The climb up again was steep and I ran into a trail maintainer out for the day and we fell into a companionable hike together for a couple of miles before he went off in a different direction to return to his car. It is always good to meet up with these selfless people who volunteer to make my day better. US9 had a great deli and, as I’d already decided to stay at the Graymoor Spiritual Center less than a mile further, I got stuck into a real, chunky, fat-filled NY sandwich, which is basically a heart attack waiting to happen, and generally chatted with fellow hikers as they came through. Just beyond the deli, after a brief return to the forest, the road led me to the Friary and I was directed to the ball field, which was an open tenting site for hikers and, despite the recent ingestion of unhealthy food, ordered a pizza. There were many hikers around the field and we all mingled and chatted amiably until hiker’s midnight (sundown), then settled in for the night. In the morning, I chatted over coffee and oatmeal with No Pain, an older black guy who’d done the trail several times before and he entertained me with several stories of his view of the changing generations. I set off for the day with the RPH shelter as an 18 mile target. I was really going well until the heavens opened and I got completely drenched. I tried to wring out my socks every twenty minutes or so, yet kept hiking, drying out as the sun broke through. The terrain was excellent, with few rocks and several flattish areas and very few, if any, steep climbs. One exception was the stupendously gorgeous ascent to Shenandoah Mountain and the glorious walk across the rocks at the top. I sat for several minutes by the September 11th Memorial Flag painted on the rocks to record the wonderful view. The combination of wet feet, wet socks and wet boots gave me uncomfortable feet from about mile 6, yet I completed the 18 miles and got to the shelter, meeting up with several old friends as well as some newer ones. As usual, I was pretty much last to the shelter, so I had to sleep in my tent with expected rain, thunder and lightning as an added attraction. The weather behaved as expected, yet I stayed dry through the night, though the tent, of course, was drenched. It is always more difficult to pack away a wet tent, so getting to your next destination without further rain is always handy, as setting up your tent later in dry conditions enables the tent to dry out quickly. My plan was to get to the strangely-named Telephone Pioneers Shelter about 17 miles away, yet my first port of call was going to be a deli, at NY52, only 5 miles away. New Jersey, and now New York, offer delis placed quite conveniently to the trail and hikers are always drawn by the lure of masses of calories to assuage their guilt-free eating impulses. Before going to bed the previous evening, I had started a rather stilted conversation with a young Japanese guy at the shelter. He was a section hiker and by himself with nobody speaking to him, so I tried to make conversation him. Despite living in Queens, his English is very basic, so we couldn’t really have much of a chat. However, the following morning, as I was preparing to leave, he reciprocated and made a real effort to speak with me. As I’ve said before, it can get lonely out here, so I understood why he was making the effort. I gave him my few basic Japanese words and we basically laughed at each other’s efforts. Once I set off, he was soon behind me and trying to chat once more. Eventually, I stopped for a rest and he moved on. The terrain, like much of this state, was challenging in terms of ups and downs, though not too extensive, while the rocks often served more to decorate the trail than to impede progress; I’ve become a real fan of New York hiking and was loving the morning. I’d told my Japanese friend about the deli and he told me that he would likely see me there. Indeed, once I got there, he was buying up the shop, with all sorts of goodies to cram into not only his mouth, but also his food bag. As we sat companionably outside, shoveling food into our faces, I asked him why he was in the US and how he had got here. He told me that he had been a worker at the nuclear reactor plant in Fukushima and that, on the fateful day, he had been working in a separate building nearby and had managed to get out quickly. However, his home was in a dangerously contaminated area and he and his family had to move to safety that very day. He also told me that, while it was a terrible day, he had come to terms with it and regarded it as an opportunity to come to America. I then asked him if he had a trail name and he said that nobody had named him thus far. Of course, the dark British humor in me immediately gave him the name of Tsunami and, to my delight, and relief, he laughed uproariously and accepted the name. So, Tsunami it is. Several other old and new friends were also coming by the deli and I must have stuck around for about an hour and a half before heading out once more. On leaving, I checked my emails and found one that necessitated a stop in a hotel and access to wifi, so I eventually finished my hike for the day at that point, with only 5 miles under my belt. I had ordered a cab for 8.30 and, after wasting 20 minutes trying to find where I’d left the trail the previous day, I was on my way by 9am. I had planned to get to Kent by the next evening, to meet up with dear friends, Brian and Dee Scott, so I contented myself on this day with getting to the Appalachian Trail Metro North train station, only about 100 minutes from Grand Central Station in NYC. Right next to the station, the local garden center allows hikers to tent on their grounds, charge their phones, get water from a spigot and use their toilet. Marvelous. The terrain, indeed, the state, continued to delight, with wonderful hiking that established NY as my favorite state so far. The rocks are never too onerous and the paths are well groomed, while the climbs continued to challenge without defeating you. Early on, I came upon the Von Trapp family, a family of five from Canada who are hiking the whole trail. They are dad (Toe Salad), mum (Fimby), a calm daughter of about 13 (Padawan), a younger, deliciously intense girl (Tenacious Bling) and a cheerful boy (Otter). They are having a wonderful adventure together and are very positive at the same time as being realistic. I enjoyed chatting to them while they were filling their water bottles and eventually moved on. The problem was that I couldn’t get the Von Trapps, or, more specifically, the Julie Andrews songbook out of my head. I started to sing, rather louder than my voice should ever be heard, “Doe, a deer, a female deer, ray, a drop of golden sun.” and so on. I was just blasting out the bit where Julie Andrews and the kids jump up and down on the stairs in time to the music “doe, tee, tee, la, far, far,” when I realized I hadn’t seen a white blaze for a while and, blow me, I had missed my turning by a full quarter of a mile. After retracing my steps, I contented myself with “Climb every mountain,” and paid more attention. Near the end of the day’s hike, I was lucky enough to run into some more lovely trail magic which, of itself, is always a terrific component to any day. This one was particularly full of goodies but, to be honest, the thing that made me most pleased was when the trail angel started recounting who had gone through, and said, “and there was this nice Japanese boy called Tsunami.” Oh yes!! I got to the garden center at about 5 pm and, after finding where to pitch my tent, chatted with the guy on duty in the center to see if there was a better alternative to the deli down the road. Indeed, there was. This young lad offered to take me into nearby Pawling, where there was a tavern. I enlisted J-Rex and her boyfriend to join me and we had several beers, wings and burgers before getting a cab back. Despite the fact that my tent was about 20 yards from the railroad line and only 15 yards from the road, I again slept well. There had been several latecomers the previous evening and I met up again with Bamboo, Ungerwear, Yeti Legs, Naturally Hob, now joined by his wife, Chickadee. Off early in the morning, I seemed to be in excellent form, with the trail taking me through a nature reserve that had me reaching for my camera. I knew I had a long day ahead of me of some 18 miles, hopefully getting to Kent, CT, where my friend Brian was going to meet me and take me back to his home. Despite looking forward to seeing them again, I was struggling a little and, after about 5 miles, I knew I was going to really have a problem making it to Kent by 4.30, our planned time. I also wanted to spend a little more time with them, so I called Brian to see if he could pick me up a little earlier, at Schaighticoke Road, near Bulls Bridge. Ever affable, he agreed and we met at 2pm on the dot. I was pretty much all in at this stage, having only hiked just over 11 miles and I seem to have these days from time to time. I can only assume the fact that I pretty much never have an intentional zero day, I am not fully recovering from the pounding I put my body through. The evening was great, with Dee cooking roast pork and making much more than usually necessary, knowing that I would likely hoover up most of the left overs, which, of course, I did. I also had a couple of glasses of wine, the first wine I had taken since I set out on my adventure, in March. Brian took me back to the trail the following morning, via the business premises that he owns, at which he showed me round like a VIP! It was really interesting to see my friend in a different environment to that in which I normally see him and he was very informative about the hydro electric turbines on which his company works. I got back on the trail by 10.30, hoping to really get cracking and knowing that I had a very tough uphill to start the day. 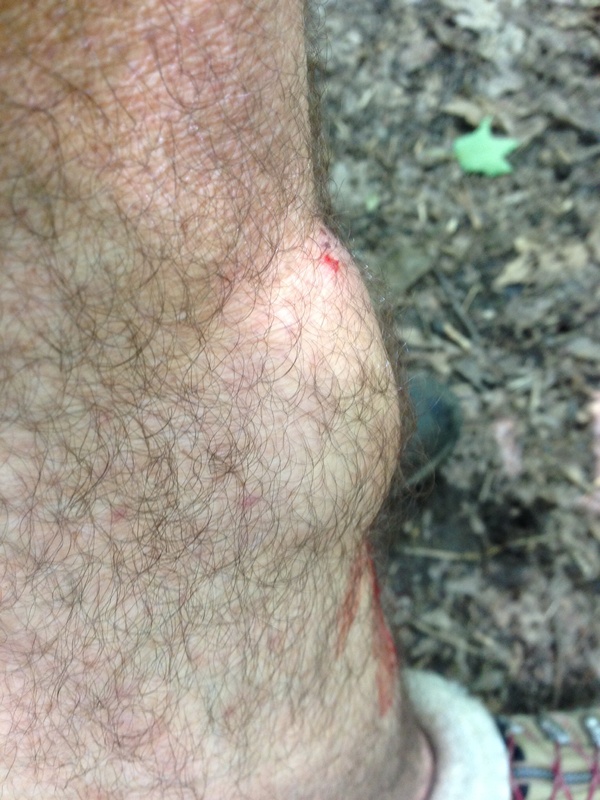 A scout troop was hiking ahead of me and I fell in about 30 yards behind them. Perhaps I should have taken note of the size and shape of their scout leader to ascertain how much he knew about hiking and directions, for we continued to march along a flat road when I knew that we should have been climbing. Eventually, I called ahead to see if they thought we were still on the AT and they thought that they were. However, I was now convinced that they were wrong and decided to turn back. I told them that I would whistle (my entirely unused bear defense) if they needed to turn round. We had gone at least a quarter of a mile past the turn, so I prepared to give them a shrill blast, only to emit a pathetic squeak, due to my rusting, untried whistle. I then had to shout as loud as I could, “You’re going the wrong way,” though I have no idea if they ever heard. For all I know, they could still be marching in a straight line, as I never saw them again. Despite the fairly late start, I was able to make camp at the Stewart Hollow Brook Shelter, after over 14 miles, so I was very happy with my effort and set up camp alongside another vintage hiker, and a new friend, Lighter Knot. After a friendly chat, we retired to our tents and I fell into a deep sleep. The walk into the camp was a long, flat path beside a fast-flowing river and I took the opportunity to anticipate New England while enjoying the easy hiking. This morning, Lighter Knot and I set out at about the same time, though I was planning to get to a road only 4 miles away, where I was planning to meet Bassman, the section hiker I’d got on so well with a few weeks ago. He had texted me and kindly offered to meet up for breakfast, then run me around to pick up any gear or food that I may need. Such a thoughtful gesture and I was looking forward to meeting him again. We arranged to meet at 10am and I was there on the dot, while he drove up about 10 seconds later. Perfect. 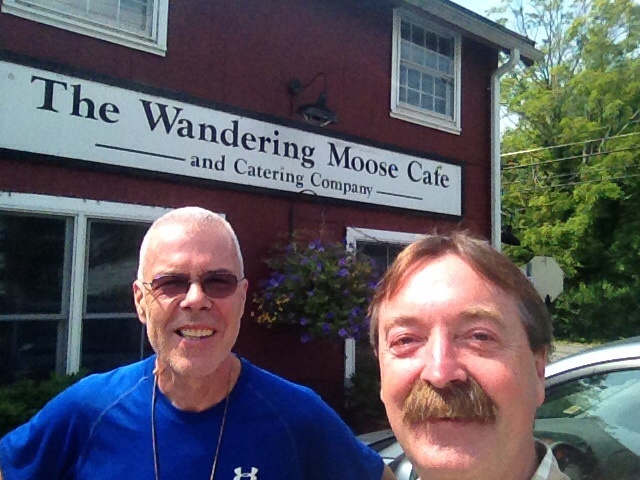 Bassman knew of an excellent diner in West Cornwall, so we went and had our fill of eggs, bacon, home fries and pancakes, the normal hiker fare when given the opportunity. After that, Bassman was as good as his word and drove me to several places, while I bought food for the next 3 or 4 days and a pot in which to cook my rice, after a bit of a disaster cooking rice in my Jet Boil Flash the previous evening. Don’t ask!! Back at the trailhead, there was a notice about the difficulty of fording a stream just ahead, with a detour offered that would have added about half a mile to the hike. “It can’t be that bad.” I thought and decided to go for it. One of my problems is that, despite strong evidence to the contrary, I always think I can do pretty much anything and I always go for it. This was such an occasion and, while I managed to get about 3/4 of the way across, my tumble into the stream was something of an inevitability, which duly occurred. 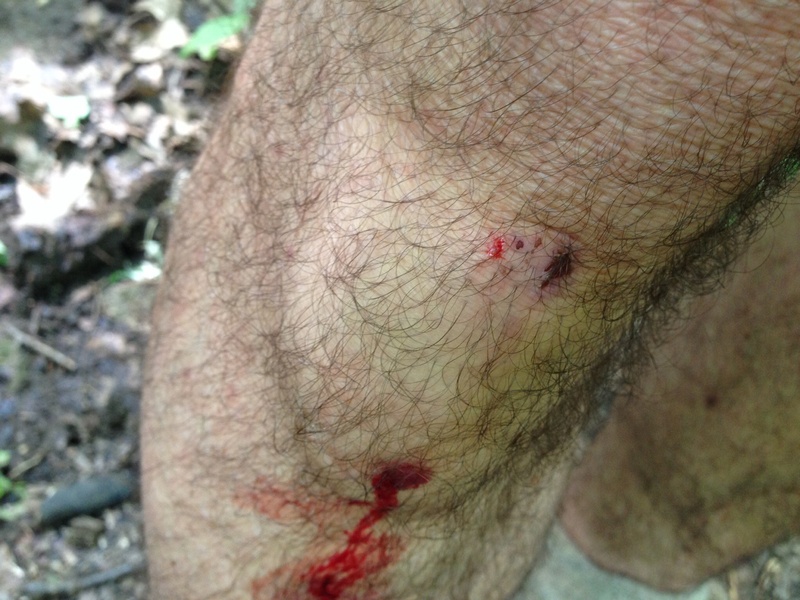 Amazingly, while I ended up with my knees and some of my pack in the water, my phone stayed dry and I quickly scrambled out, only to see a little blood trickling down my leg. I wouldn’t have worried too much about that, had it not been for the egg-like protuberance that accompanied the blood. To be honest, this was alarming and, after walking for about a half mile, I decided to seek yet another Urgent Care facility, as the swelling was spreading rather expansively. Alone, in the woods, such things aren’t quite as easy as that yet, as so often, the Trail provides. I soon ran into an AT volunteer, who offered to take me to Torrington, some 20 miles away and I got to the clinic about 20 minutes before it closed. The doctor told me that there wasn’t a particular problem and that the swelling would go down with a night’s rest and some icing. The nursing assistant was a hiker and he not only cleaned up the wound, he arranged a room for me at the Quality Inn and ran me down to the hotel in his car. As I say, the Trail provides. So here I am, back in a hotel, with another chance to blog and an injury to accompany my 19th fall of the trip. I have a cab tomorrow morning at 7.30 and I’ll be back, trudging along soon after 8am. This has been a tough week again and I’m aware of the worry that I keep putting Diane through, yet I keep seeing those miles count down. By Sunday. I’ll be passing the 1500 mark and tomorrow, I’ll have less than 700 miles to go. This is going to happen, I’m going to finish and, when I do, nobody, apart from Diane and me, will know quite how much of a trial this has been for us both, yet I wouldn’t change the next couple of months for the world. So, hold onto your hats, we’re into the last third, wish me well and cheer me home. Oh, I just love the read and adventure, feel like I’m there. Going to miss it when it’s over. Take good care of yourself, the end won’t be far off. Angels on your sholders. Thanks Marilyn, though, funnily enough, I’ve missed Holmes Beach! It is my wife’s and my favorite spot in the world and we’ll be heading there when I get back. Sorry about your 19th – but so encouraged by your attitude to press on for the last third! We cheer you on from here and look forward to the pictures from the top of the end of the Trail – and the Trial! Thanks a lot Ed; you’ve been so supportive. Hey mighty blue! It’s digger . Met u back in North Carolina . Glad u still out there. Take care. I’m going into Maine this week. I hope to summit this month. U watch your step! Hi Digger, good to hear from you. You may not know it, but you gave me some great advice in the brief time we hiked together, so thanks. Congrats on your progress. Let me know when you get there. Cheers. Clumsy as ever then Adams ! Very fetching lump on the leg ! Pleased you’re still so positive – next time you decide to hike ,can you make it in the UK , then I can make the occasional trail visit ! I’ve done 38 miles in the two days after that sorry saga, so I’m right back into it. Steve…Enjoying your prose! Love that you were able to give Tsunami his name and admire your sense of humor after spills. From what little I’ve read to date of your blog, it really does seem to be about the road travelled and not the destination. Learned about your story from a friend who invited me to your talk in October. Very much looking forward to reading more. Have a great walk out there and stay safe! Thanks Barry. It continues to be both a constant challenge AND a delight. Tsunami … I literally laughed out loud. Sorry about the leg and so glad you are getting along again. Can’t wait for you to get home, but so glad there is more to this adventure you have shared with all of us.